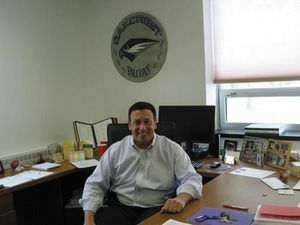 In the wake of a recent loaded gun incident at Absegami High School, Greater Egg Harbor Regional faculty and staff are speaking out about the lack of a proactive approach to security issues by Superintendent John Keenan and his dishonesty about the district’s safety procedures. Since the beginning of the school year, there have been 572 disciplinary issues reported at the three high schools. These incidents include dangerous/unsafe behavior, disorderly conduct, threats, fights/physical altercations, and weapons offenses. That’s an average of 26 incidents every day that school has been in session during September of this school year. Some of the students involved in these incidents were known to have serious behavior issues at the middle school level. In fact, they were recommended for out of school placement, but the district chose to keep them. At one school alone, three knives have been confiscated since the beginning of the school year. Keenan was reported in the press as saying that the district has a system in place for students to alert officials, administration and staff anonymously of suspicious behavior. However, the truth is there is no mechanism currently in place, although it was promised at the end of the school year, according to GEHREA President Stephanie Tarr. Staff was told at the end of the 2015-16 school year that there would be a security app for students and staff to use in the event of an emergency at the beginning of the 2016-17 school year. They were also told that they would be trained on the app at during the in-service days immediately preceding the opening of school for students. That training did not take place. Then they were told they would be trained at the first faculty meeting. That training also did not take place. Now, they are being told that the training may finally take place on Oct. 10. In addition, under Keenan’s leadership, a student was permitted to return to school after assaulting a teacher. A new Board needs to voted in and Keenan voted out. Carol Houck has been Keenan's right hand person in these bad decisions and it has to stop. My childs safety and education is important. As a parent we trust the teachers have our children's best interest in hand and it seems like they do but the Superintendent doesn't. VOTE THEM OUT!! Security has been lacking at Absegami for years! 2008- Student assaulted in a gym locker room with a broomstick. 2012-2013- Botched graduation ceremonies due to failure to anticipate severe weather. 2016- Student brings loaded handgun to school. Let's not let the list get any longer. It all starts with voters and trickles down to having a board, superintendent, and principal that are in touch with parents and taxpayers. Our kids deserve more than this. Make the change on November 8th. If you feel so strongly about that then step up and run. Let's see you volunteer your time doing this. Cracks me up how people can say whatever they want. You have no idea what the board members are like personally. Reading an article by an irate member of the district doesn't mean these members are all bad. Put your name on the ballot next time someone in your township is up for reelection. Spend your free time doing what they do. Proactive begins with the belief you share for safety. Begin by allowing good beliefs to be put forth again. Pledge to God and country be restored. When prayer and faith in good was put out of school, the void was filled with those who prey on others and pray that you prey on others. We need to restore all the rights of our Nation's constitution by teaching respect for life and liberty to make and defend good law. Protests of good people for good reasons are not the same as riots by people out to destroy our safety and property. That is thug action and not a true reform platform. Thugs need to be arrested and tried. I attended school for 12 years where prayer set our belief in good, teaching set our mindset to accomplish it, and if our actions did not match that good we were given the mercy to correct them. If uncorrected appropriate punishments followed also guiding to correction. If you did not learn you could leave and join those who prey away their lives. Each decision made daily is for good or harm, make a wise choice daily and live by it. From what I have read, the main problem seems to be the choice of the superintendent and his leadership skills. Didn't this Board do a background check on this guy? I just googled his name and a ton of information came up about the last district he was in in north jersey. None of it positive. Try it. Then you will wonder why this guy was ever hired. I feel that since these behaviors began in middle school and now in high school, both the superientendent and principals should step down. Including middle school principal. Last year at the middle school my daughter was affraid to go to school because students were out of control. My daughter said they never got in trouble . My daughter didn't even go on the eighth grade trip because she was scared. If one student is scared thAts one to many. Principal junker was ignoring behavior so she didn't have to report the middle school. The kids would run from her and had no respect . Now these are the kids moving towards the high school getting worse. Principal junker should step down too. Kids should feel safe at school. This needs to be investigated at the middle school level too. I heard teachers were hurt at the middle school too . Unfortunately- families are a mess these days and schools have to handle more than ever- now we need to hire principals who can make a difference . We need to look at successful schools . When you have a principal who's first line of defense is to blame then he or she should be fired. I was saw this with my own eyes at GTMS. I saw the eye rolling and the fake smiles from the principal. She does not have the gusto to make changes or empower her staff. As a fsa parent you see a glimpse of how things are run. When teachers are miserable because of their administration there is a problem. When teachers are affraid to speak up for our children because of fear of administration then there is a huge problem that should be investigated. Parents need to become more involved. We need to help our children and our children's teachers. I agree . Teachers are affraid to speak- out bc of their jobs. Last year at the middle school kids ran from the principal and I saw a kid curse the principal in the office and she just smiled . She did not know what to do. . The teachers were affraid and are not allow to say anything to families. Where is the njea now? How come the njea is not protecting teachers and students? Where is the union? So you are saying that teachers are not speaking out to protect our children ? What is going on? If the principal at Galliway middle school hushed teachers she should be fired. If that is true she put our kids safety at risk. I was not impressed by her but I did not know this was going on. Parents we need to go to board meetings . We need to address our concerns . This principal put our children's. Safety at risk so she can look good. This is wrong in so many levels . She should be fired. It's a sad day in our city when our children don't feel safe at school. The absegami superientendent should be fired for hiding problems. I understand money is an issue but safety comes first. Safety for both students and staff. A student brought a loaded gun to school. That is outrageous. My son is in 8th grade at GTMS. I'm affraid to send him to Gami. I'm affraid. As for GTMS, I haven't seen problems this year. Last year, my kids did tell me about the drugs and behavior. They also said kids were not getting in trouble for behavior in class. My daughter was in advanced classes and there ( now at cedar creek) was a student who acted out in every class. The student had little consequences . My daughters teacher was replaced in March . The teacher who took over could not handle the class therefore my daughter was not learning. Her PARCC score even went down. My daughter would come home every day with a new story about this student who interrupted instruction every day. He pulled the fire alarm, he pulled the water valve in the science room , he screamed obscenities in the class and hall . The principal did not take care of this. My daughter ate in the library or with her math teacher everyday because she was affraid to eat in the lunchroom where kids were throwing chairs. I know schools are under pressure but my daughter did not recieve a quality education last year. Her parcc scores went down to prove that. In addition when my daughter was in 7th grade the kids were having the same problems with the one student too. So my question is- why does the principal hide these behaviors.? Hiding them puts our children at risk . Is there a penalty for schools with behaviors? If so- it's wrong . These things need to be addressed. Again- walking through GTMS for back school night seemed upbeat but if the principal is going to not report problems then she should be fired. She appears to be inexperienced. I have like all the elementary principals but I am concerned at GTMS. It's a shame that the administrators have so much power to do good but they are to ready about their reputation and scores. Unfortunately, the district is putting their needs over our children. That's disgraceful. The students who are acting out need help and strong principals who have leadership skills. GTMS needs a leader who can create changes not someone who is hiding problems to make herself look good . I am too concerned that the school teachers are not speaking up. What kind of environment is the principal creating ? She definitely should be fired. GTMS needs a leader who can promote a safe environment, principal junket is in it for other reasons . This is the problem with tenure. It takes $$$ to remove bad principals and teachers. If the superientendent of Greater Egg cared about our schools , he'd step down . The same with the GTMS principal. They both should step down and allow someone else to run the schools that is not affraid to get his hands dirty and improve the schools. Hiding the behavior and problems should be a crime . It puts our children at risk and it lies to the community. They both should step down for dishonesty. This is why being involved counts . The administrators are doing whatever they want with our taxes. This is so disgraceful. I substituted last year at GTMS, and it was out of control. Some students were bad. I had a student steal my cell phone off my desk. I talked to the teachers and they basically said that the kids are running the building and they get in trouble for writing them up or the administrator would hand back the write up to the teachers. The teachers did not feel supported or safe . I felt bad. The kids weren't bad there was just no consequences for behavior. Nothing happened to the kid who stole my cell phone. I did get it back but the student had no consequences . I was told it was my fault for leaving my phone on the desk. basically the principal took the responsibility off of the student and blamed me .I was in shock !That's how the principal is able to keep discipline down. They ignore it. I'm not sure why . It made no sense to blame me and not reprimand the student. The only thing I can think of is that they want to pretend there were no problems.I also can attest to the lunchroom being out of control . Kids were popping milk cartons and then throwing them. GTMS is a good school. I just think the principal wants to pretend there are no issues with behaviors. It's sad bc the teachers appeared to be so defeated. In the team I substituted in there were about 10 behavior problems . 10 kids out of control. I didn't know what to do . The principal does appear to be young and when you are young you have less experience. I can also share that she was not the friendliest person. Thank goodness for the teachers and office staff. If these issues with student behavior being buried theb the principal of the middle school GTMS and absegami superiendent need to be fired. This is not keeping children safe. Basically the middle school is pushing off the problems to the high school. The kids are the victims. Kids who need boundaries and discipline and given none. That is horrible . If you put yourself as an administrator in this position you should be prepared for the community to to ask you to resign. How dare you put our children in danger. How dare you hide important information and how dare you blame teachers . This is deplorable behavior. GTMS principal needs to resign and so does the superientendent of Gami. They must be working together. I'm sure they will blame each other . As a public employee being honest to the public is must. I cannot fathom how this is happening in galloway. Can we sue these administrators for not doing their jobs and putting our children in harms way? Wait , teachers are getting in trouble for issuing discipline referrals??? Are you kidding me? The principal was giving back the teacher referals for discipline ? Omg - that is disgraceful . This is disheartening . What kind of administrator would treat teachers with such lack of respect and support. I am a teacher and my principal would never act like this . He is an encouraging person who listens to his teachers , even the grips. We are all on one side. Wow- galloway you need new administrators. As an educator this is difficult to believe . I hope these posts are wrong. A bad principal can posion a building and kill the morale of the teachers. Galloway- I hope this isn't true , but if it is , teachers you need to collaborate with the union to have the principal removed. Parents are freaking out over the gun issue. The schools need to open up and share what's going on because people in the community are upset and scared for our children. 25 incidents in one day at school is a lot of bad behavior. The community wants the truth. We deserve to hear the truth. Our tax dollars fund the schools . Our voices need to be heard. We are not happy and we want answers And we want our children safe. The schools need to share with the community what the plan is going to be. If administrators are lying and downplaying incidents , shame on them . They are placing our children in danger by withholding the truth. If administrators do this they are abusing tax payers money and placing our children in danger. Sorry Donna , there was a loaded gun in the gym with a bullet in the chamber. The schools need to be investigated. If administrators need to be fired then fire them. Safety comes first. Fact- Since Mr.Keenan took over at GEHRHSD, Security has been depleted at all three High Schools. Three full time Guards (Retired Officers) have resigned and he eliminated 3 nightwatchman positions without replacements. They hired retired Galloway Chief Pat Moran to temporarily oversee facilities. Maybe he can provide the Board with insight how to address the security issues.REALITY CHECK! Were not in a wealthy Northern Highlands District Mr. Keenan.Compare the Uniform Crime Reports between both districts. Maybe the next time students wont be just "pranking" at Oakcrest by doing mischief at night in a unsecured building. Maybe next time they will be planning something far worse. seriously... I get what people are saying... and safety is very important but I agree... the irate teacher union rep who don't have a contract is the last person the should get an article in the media to blast everyone. That Ess program has done great work in 2 different states and has highly trained staff. The fact that they didn't "fix" a kid within the first 2 weeks of school is ludicrous. Let's stop pointing fingers and come together to fix the breakdowns. I have substituted at GTMS too and I'll never go back. I agree the principal has created a miserable environment. I asked her a question about the hours because I wasn't sure and she made me feel dumb for asking a question. I didn't know what to do and I felt belittled. She has no people skills. The vice principal helped. She was very nice. I have substituted at Reeds Road and the principal there is very helpful and friendly. I agree that no fingers should be pointed and it looks like the district was at least trying to be proactive with some things like that program, but from my I understanding the security was the issue and that is the problem that needs to be addressed. I'm sure all the teachers and the program staff, and faculty were doing their due diligence. The security..
to me is the main issue. I am sure the district was trying to do what it right, however at the same time it was trying to save money. It appears saving money trumped doing what is right. That's the problem. Districts hide bad behaviors to reduce reporting to the news papers. Eventually, the lies catch up to you and it is at expense of children . Our children were put at risk because the district didn't report the truth and wanted to save money. Perhaps there needs to be independent investigatations by the state. The investigation should include speaking to the teachers. The teachers are not the ones balancing budgets or ignoring behaviors so it doesn't have to be reported to the news paper. The teachers will tell the truth because they're the ones in the classrooms. Parents , we all need to attend the board of education meetings to create change. It seems the Change needs to start at the middle school. We need to attend the middle school meetings and high school meetings. It doesn't matter if you don't have kids at the middle school. We need to make sure that they are not down playing behavior putting our children at risk. I heard numerous stories about kids being afraid to go to school since the incident with the loaded gun. Our children need to feel safe at school, we need to demand change. I will see you at the Board of education meetings. I have a friend at GTMS and he said the same thing. He said the students were not getting consequences and the principal was combing discipline referrals . So if the student skipped a class, cursed, and told a teacher to F off on seperate occasions those 3 discipline referrals would be combined into one consequence. Most likely a detention. Then Teachers were blamed for student behaviors. he said the students knew they weren't getting in trouble and they were bragging about it. Sounds like a recipe for disaster to me. So when these students walk over to gami , it makes sense that they try the same behaviors. They were taught at middle school that the teachers were the problem and they did not learn consequences. I guess that's why the teachers are miserable. They are the scapegoats. Lorraine, the teachers need to speak - out. There are laws that protect them like whistle blower. If the teachers keep their silence they are just as bad. Teachers need to be advocates for their students. If their students are t safe because of a few students they need to advocate for the others. If the principal stops this then the teachers need to contact the union and press. Part of being a teacher is protecting kids. There is power in numbers. There is just one principal and several teachers . Don't protect bad policies , protect children. The community supports you, take care of their children. The teachers DO speak out -- and are ignored. There are a number of students who have assaulted teachers, and the teachers had to be the ones to press charges, not the school. They come to the union. We have told Mr. Keenan that we are worried about safety. He gives us some platitudes, but does nothing. Please, parents, come to our board meetings and speak out. The lack of transparency is sickening compared to other BOEs. And to address another comment I saw either on here or another article, I am not "irate because I don't have a contract." I am irate that my colleagues and my students are not safe! I care about them most of all! So sad these comments are so inaccurate and unfounded. I work at GTMS and it is a great school with dedicated teachers, support staff and administration. Stop mixing up GTMS with Absegami they are two different school districts. Get your facts straight! Not true- GTMS teachers are ignored too. I saw it first hand last year. If they were supported , my daughter would've gone on the trip last year and felt safe at school. My daughter , daughter said the kids ran her team. She stated the vice principal spoke with the team students but the students weren't heard. The students reported there needed to be tougher discipline. My daughter and her friends said the same students acted out everyday in the advanced classes. Everyday their learning was affective. My daughter said the students never listened and the vice principal always brought the student back to class and nothing changed . She also said the students ran from vice principal and she gave them fruit even when they were bad. That's supporting staff and students . I'm sorry, I taught for years and in my professional opinion it's lack of experience and support for teachers. That's why GTMS and Gami are being compared. Low morale in teachers because they don't feel supported and hiding behavior which equals poor leadership. Students should not be allowed to disrupt class and get fruit. Students should not be able to yell at teachers and blame them for their own behavior because that's what the administrator told them. What kind of school administrator tells a student the teacher yells to much and the teacher is the problem ?? That's supporting teachers?? That is so unprofessional and demonstrates weak leadership. Instead of helping a situation administrators are put down . That is a recipe for poor leadership . I know this happened because when my daughter was at GTMS. My daughter stated these events and teachers confirmed it. Teachers are not loyal when administrators are ineffective .